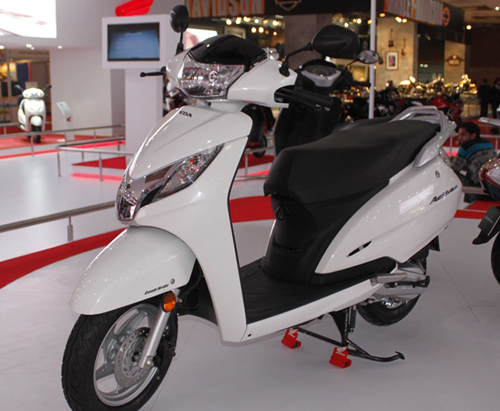 New Delhi, April 28 : Two-wheeler major Honda Motorcycle and Scooter India (HMSI), Monday launched its largest selling scooter brand Activa's 125cc automatic variant priced between Rs. 52,456 and Rs. 58,196 (ex-showroom Delhi). "Propelled by new third plant near Bangalore, Honda is all set to excite customers with new products with speed. In this background, Activa 125 is Honda’s next strategic step towards reinforcing market leadership and facilitating Indians to step up their daily ride for more power,” said Keita Muramatsu - president and chief executive, HMSI. The automatic scooter segment's share in the two-wheeler industry has grown to 24 percent from 16 percent in 2009-10.